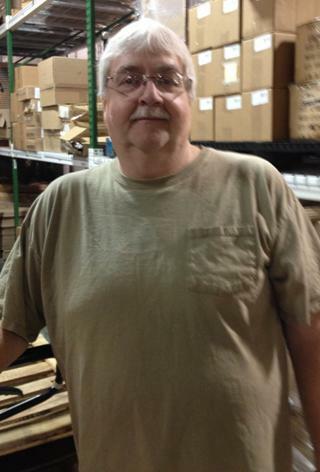 From the warehouse, the November Employee of the Month is Dave Lang. Dave joined the Online Stores family in March, 2010, and has been a great asset ever since. Dave’s primary role is with the production department. His role in production is to oversee the staplers and make sure they have all the supplies they need in order to keep working at a fast pace. He also completes any engraving for the engraving plates we offer on our Flag Store, as well as makes the name stickers for the customers requesting their name on the hard hat. Dave occasionally is called upon to work on side projects that need completed in the warehouse, and sees them through to completion. In addition to being a certified forklift trainer, Dave also packs and wraps freight shipments and makes residential flag poles. Dave earned the title of Employee of the Month for his desire to provide service to customers and his helpfulness with other employees. More recently, Dave has helped Sales Manager, Michael Hunt, with several projects. Dave did an extensive search of the warehouse to help find a product that Michael needed for a customer, then personally walked it through the shipping process to make sure it was done quickly to get out to the customer. In addition, Dave approached Michael with information regarding the Family Dollar order from last year, in order to help Michael make a smooth transition into his role and be able to best gauge what needs to be ordered for the Family Dollar order this year. Thank you, Dave, for all your hard work! Congratulations!